An increasing proportion of all detainees are being transferred. In FY 1999, one out of every five (19.6%) of the detainees was moved from one detention facility to another. During the first six months of FY 2008, the latest period for which complete data are available, the majority (52.4%) of detainees were transferred. See Figure 1 and supporting table. Almost as startling was the growth in the percentage of individuals who were subjected to multiple transfers — starting at one detention facility, being transferred to a second, and then again (and sometimes again and again) to other detention locations. Ten years ago only one out of twenty detainees experienced multiple transfers (5.6%). In FY 2008 one out of every four detainees (24%) was subject to multiple transfers. See Figure 2 and supporting table. As a result of these combined trends, the number of times that detainees are transferred now actually exceeds the total number of individual detainees. This surprising tipping point — more transfers than detainees — was reached for the first time during the first six months of FY 2008. The findings are based on the analysis of data drawn from a range of different sources obtained by TRAC, plus an additional 3.4 million records obtained by the Human Rights Watch under the Freedom of Information Act. These records are reported to cover the detention history of each individual who passed through ICE detention facilities or those of its predecessor agency, the Immigration and Naturalization Service (INS), from October 1, 1998 to April 22, 2008. Using this information, TRAC compiled a detailed facility-by-facility picture of each detention center's role in the immigration detention system. In total there were 1,528 different facilities recorded in these data as having been used to house ICE/INS detainees over the last decade, of which 654 housed ICE detainees during the most recent 12 month period covered by these data. Some facilities housed many detainees, others housed only a few. To enable the public to examine the country's immigration detention system in more detail, TRAC has developed a unique new facility-based reporting system that provides details on each of these 1,528 facilities. Detainees were transferred from 1,393 of these facilities. The first edition of this reporting system focuses on the topic of this report — detainee transfers from each of these facilities. Individual facility reports. The second part of the system is individual facility-by-facility reports. 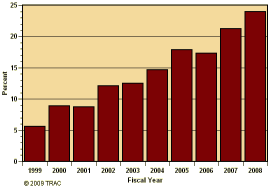 These individual reports — complete with tables, graphs and text — analyze in depth just how many transfers from a given facility took place, the number of detainees the facility held, how the counts have increased or declined over the last decade, how long individuals were detained there, and whether they were transferred to a facility in the same or different region. Comparative rankings for each facility are included, as well as statistics about the nationality of detainees and the likelihood of their transfer to a different region of the country. In this first edition covering detainee transfers, in-depth reports are available for detention facilities that transferred at least ten detainees during the last twelve months for which comprehensive data are available (April 2007 - March 2008). The reports cover the recent 12-month period as well as provide information about changes over time in the annual detainee population and transfer patterns. For all of the remaining facilities that held detainees going back to FY 1999, shorter reports have been prepared. Many of these older facilities no longer house ICE detainees. TRAC has drawn upon a variety of data sources, combining the records we received as a result of our FOIA requests and other efforts with the records obtained by Human Rights Watch through its independent FOIA request. The data, organized by detention facility, provide a record for each detainee that passed through a detention facility's doors over the last decade. Included is specific information on the date an individual was booked into a facility, the date the individual was booked out of that facility, a code for the reason he or she left the facility, and information on gender and nationality. 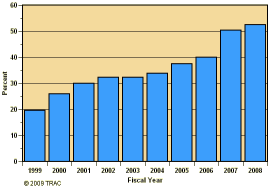 TRAC's own efforts to obtain data about individual ICE detainees, as well other information to clarify the hodgepodge of confused and secretive records regarding the mix of detention facilities used by the agency to house them, goes back to February 2006. At that time, in addition to seeking information about the detainees and their individual characteristics, TRAC requested copies of all ICE contracts with private companies as well as all the Intergovernmental Service Agreements. Under these agreements with local and state agencies, ICE obtains space in local jails, state prisons and other facilities to house detainees. Unfortunately, the materials produced by ICE after more than a two-year delay were both incomplete and heavily redacted. Here is one example. 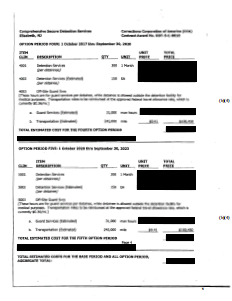 For each signed contract, vital information such as dollar amounts to be paid by the government had been blacked out (see example). Also blanked out was information about the particular criminal code that a detainee had been convicted under. Administrative appeals by TRAC resulted in further delay. Ultimately ICE released some copies with fewer redactions, along with additional contracts. An additional difficulty was that ICE records identified each detention facility with a code, but details on the nature of the facility — even its name — were sometimes sketchy. Information on who actually operated the facility — e.g., a government agency versus a private company — was not included. ICE has very strict confidentiality requirements that do not allow [us] to give out too much information on our contracts. Over and over again, almost since the founding of the United States, the regulation of immigration has presented the nation with difficult political, social and management challenges. As documented in this report and the development by TRAC of a new mechanism to provide the public with otherwise unavailable information about the hundreds of facilities where undocumented aliens are detained, these challenges very much remain with the American people today. "Immigration Detention Overview and Recommendations," by Dr. Dora Schriro, Immigration and Customs Enforcement, Department of Homeland Security, October 6, 2009. "Locked Up Far Away: The Transfer of Immigrants to Remote Detention Centers in the United States," Human Rights Watch, December 2, 2009. The Transactional Records Access Clearinghouse under a grant to TRAC from the Four Freedoms Fund prepared an analysis of ICE transfer records, results from which were incorporated by HRW in their report. Support for the initial phases of this research was provided by the Ford Foundation, the JEHT Foundation, and Syracuse University. The later stages of this work were supported by Syracuse University, and by grants from the Four Freedoms Fund and the Carnegie Corporation of New York.